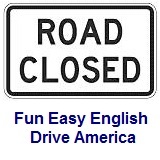 ﻿ Fun Easy English - Drive America - United States of America road signs, rules, and regulations guide, recreational services. Recreational and cultural interest area signs for general services provide information about traveling necessities in a designated area. These signs are very helpful if you need to use the bathroom, find transportation, have a problem, or simply need some information.